For the third time running, Barça are returning from Vigo without a win, but there will be far less concern this time. Because tonight’s meeting was in the Copa del Rey, where a score draw away from home in the first leg is never a bad result. It sets things up nicely for the second leg at the Camp Nou next Thursday, where the likes of Leo Messi and Luis Suárez, rested this evening, may well be sent out to finish off the job. And Barça’s new year prospects have also taken a major boost with Ousmane Dembélé playing his first competitive football since getting injured over three months before. Celta came off the blocks looking the hungrier of the two sides but may have been in too much of a hurry to make an early impression on the game. Barça took it all in their stride and on the quarter hour were into the driving seat. It was José Arnaiz of Barça B, standing in at the spearhead of the attack, who slammed home an Andre Gomes assist. 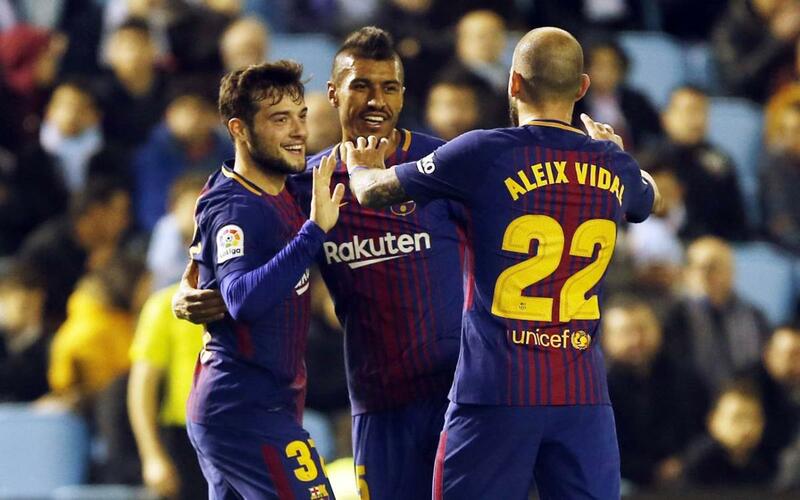 That was three goals in as many appearances for 22-year-old in this year’s cup campaign and the perfect start to 2018 for the blaugrana. 15 minutes further into the game and Celta hit back. A lively goal it was too, with Iago Aspas firing onto the crossbar and the ball rebounding off Jasper Cillessen as far as Danish winger Pione Sisto, who thundered into the net. The whole thing had looked so unorthodox that the Barça defence seemed right to assume there had been some infringement along the way. There hadn’t. The goal was legal and we were back on level terms. With tunes as good as those on the Balaídos PA system during the break, the players were always going to be fired up for the second half. Barça were finally stamping some authority on the game while Celta started feeling the effects of their first half exertions. Denis Suárez failed to connect properly with a Nelson Semedo cross and Sergio Busquets fired onto the crossbar. The second goal didn’t want to come, and with twenty minutes left on the clock, Ernesto Valverde decided the time had come for Dembéle. After over a hundred days side-lined, the star French signing was back into action. In action he was indeed, involved in almost every Barça move as they pushed forward on their quest for a second goal. But Celta weren’t sitting back and settling for a draw either. As the game drew to a close, they seemed to find new vigour and had more than a couple of decent chances of their own. It ended 1-1, a result that both sides will probably look upon positively. Celta will have something to defend when matters resume next Thursday, but Barça will be expecting to make home advantage count and secure a place in the quarter finals. One thing’s for sure – the second leg promises to be a cracking game between two sides that play some very pretty football indeed. It’s a 9.30pm CET kick-off, and if you’re lucky enough to be in town that night, you can still get TICKETS HERE.